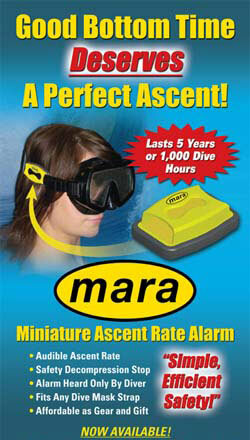 The Miniature Ascent Rate Alarm - MARA, was designed to make the sport of diving safer. It has been found to be exceptional for the training of new and seasoned divers alike to ensure they ascend at a safe rate. As a well trained diver, you know a safe ascent rate is one of the most important aspects of diving. MARA ensures the diver is aware of how fast they are ascending to the surface with no effort from the diver. Complementary to gauges and computers, this unmistakable audible alarm, heard only by the diver, reduces the divers reliance on other devices to assist the divers ascent without complication. MARA is the perfect gift for the safety oriented diver. It has proven to be especially helpful in low visibility situations and night dives where gauges are difficult to see. Allowing for a non visual indication of ascent rate ensures the diver is looking to the surface to prevent collision with surface objects. When you can't see or hear your dive computer MARA is always there! Every diver should have one!